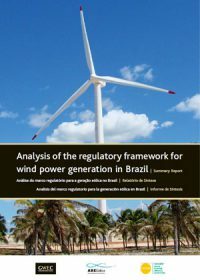 This study, which was undertaken in cooperation between the Brazilian Wind Energy Association (ABEEolica) and the Global Wind Energy Council (GWEC), provides an in-depth analysis of the Brazilian wind energy market. It evaluates the effects of the regulatory approaches to date, analyses the market and the industry, pinpoints remaining obstacles and challenges, and provides recommendations for legislative improvements. This report is provided in English, Portuguese, and Spanish.